Kelvin Smythe “Some terrible things have been perpetrated – close to evil. In my recent paper “Belief Systems, Control Systems, Response Systems”, I tried to point out that the prevailing neoliberal political climate in Australia induces our elected ‘masters’ to use authoritarian methods based on fear and coercion to try to force others to do what they want them to do, without reason. Some terrible things have been perpetrated. Teachers, parents and school pupils appear to suffer the indignities calmly, but all is not well. As a reaction to this authoritarian political mind-set, they is a lack of spirit at the chalk face and everybody suffers….kids, parents, teachers. The reaction to such low-level, fear-based managerial tactics is such that absolute rejection of high-stakes testing is on the cards. Ethical professionals can only tolerate so much. With Kelvin’s permission, I have adapted his germane paper to apply directly to Australian conditions. I have changed any NZ references to Aussie ones. It suits neatly; and since he is much more erudite that I am, I strongly commend your close and critical attention to his advices. Interested educators can compare his original paper with what I have done to it. I gladly share these opinions…..with loud applause for the final statement. If the media and the Australian people were able to comprehend the terrible things that have been perpetrated on their primary teachers they would be taken aback. And now it is coming to a head. If school education is not run in good faith between teachers and politicians then school education will fail – and is failing. Teachers will never be in a position to counter the simplistic, bad faith, distorted arguments of politicians bent on implementing secret agendas. The policies imposed on teachers, when they fail, as is inevitable, will soon see politicians frenetically hide the failures: hermetically sealing off education with propaganda, statistical corruption, and a ruthless programme of Kafkan fear. But because the agendas are so ideologically embedded, further policies from these are reflexively returned to. These will be characterised by more hierarchy, more imposition (only minor details up for discussion), and more levels of bureaucracy. This is the way we are, as is what follows. Teachers in the interests of children and their professional integrity are committed to an open-minded consideration of education issues. That means any engagement with politicians working from a secret agenda, will fail. Teachers will make no headway against the full propaganda weight of the politicians who deal in simplistic messages expressed in abstract nonsenses, lies, distortions, non sequiturs, and evasions. Words have flowed in a near impenetrable disgorgement of arrogance-laden toxicity; their arguments dependent on a fantastically protected ignorance and an unrelentingly calculated slantedness. Above all, almost all politicians in Australia have protected themselves from any recognition of the holistic in education. The holistic is detested and feared by the current crop of bureaucrats and politicians because it is based on variety, the free exchange of ideas, and democratic processes. It is also detested and feared because teachers following the holistic do not see children’s learning in the basics as mutually exclusive of getting children to think flexibly and imaginatively. The holistic would turn primary education away from ghettoising less able children to an exclusive basics’ curriculum, and what is not generally appreciated, restricting the more able children to largely the same. If written at a certain level, in describing and accounting for this, few references to education need be made, the issues involved being central to the functioning of all societies: the nature of power and democracy, authority, authoritarianism. (Note: authority is used for the combination of political and bureaucratic power.) In relation to primary school education, power is increasingly being exercised as an end, not for the declared beneficial purposes; authority as an end with other considerations secondary; authority degenerating into authoritarianism using the cover of acting in the public good. This is necessarily a judgement because authority has, of course, presented what they were doing as intended to meet the declared beneficial purposes. However, the real but undeclared purpose by those currently wielding authority is that power needs to be increased not only for the declared beneficial purposes but also for future unspecified ‘beneficial’ use. This is a formula for degeneration into authoritarianism encouraging authority to play a cunning short game in the interests of an unrelenting long one. The cunning short game providing an excuse for those who want to yield to authority. Authority has the power to lie, distort, and propagandise with impunity; to promote delusion based on a default desire to trust authority for the comfort of conforming and thoughtlessness; and to promote delusion relying on ignorance or lack of imagination. This I suggest has occurred to a devastating extent. The leaders of groups appointed to be voices for the people, including political parties, are not immune to this process, many becoming oppressors of the people they were put there to represent. Authority, through propaganda and status, is able to control the collective will and use it as a blanketing sanction. And as authority gains dominance, and the democratic means to oppose reduced accordingly – easily observable expressions of force diminish, and voluntary compliance to meet authority goals takes their place. Fear of authority is sublimated to allow constructed compliance even co-operation. Moral and ethical challenges, as a result, are no longer posed, conformity to authority entrenched, and democracy cast as inefficient. Bureaucracies or quasi bureaucratic adjuncts (privatised entities) are the instruments for applying authoritarian sanctions, being able to retreat into themselves to become impenetrable for anyone seeking redress and impersonal for anyone seeking explanation. As well, no bureaucracy has ever abolished itself, only transformed itself, to avoid the heat or to take an even more dangerous form. Primary education is so complex, far more than secondary, that to explain it satisfactorily needs time and a willingness in the listener to genuinely listen. Primary education has the answers to the questions being asked but neither authority nor the media is listening because to listen would give respect and a degree of power to teachers. Authority is also not listening because it is intent on scapegoating teachers so that it can impose its own ideologically-based ‘answers’ for power and ideological advantage. For curriculum change to succeed there needs to be the opportunity for a free exchange of curriculum ideas and the freedom for teachers to colonise the curriculum – but teachers do not feel free to exchange ideas or colonise curricula, they are made to follow rigidly the official standardised line. A stern eye is kept out for deviancy. There is now, no official national curriculum only national standards. There is only one way to teach, that is in measurable fragments with fiddly objectives of various nomenclatures attached. NAPLAN’s control of the curriculum brings children’s learning down to a level politicians and bureaucrats can understand, and provides them with the perfect blunt instrument to control schools and trivialise the curriculum. And what is an explanation of the holistic? The holistic curriculum is about a combination of knowledges – teacher and academic; about the interaction of the affective and cognitive; about teaching and learning being organised by broad aims (assisted by criteria that can be considered converted objectives); about those broad aims being an expression of the essence of curriculum areas; about a broadly-based curriculum encompassing the wide range of human experience; about learning being meaningful, exploratory, and challenging (hence the attention to discovery learning and problem solving); about learning being open to the transformational and sensitive to the immanent; about learning being coherent and organic not fragmented and desultory; about teachers having considerable individuality of response within the broad school aims; about children having significant control over what and how they learn; about evaluation practices being proportionate to that which is educationally important (to the holistic); about all learning being quality learning; about attending to individual needs through a combination of class learning set up for individuality of response and one-to-one teaching; about class and school practices, for instance, evaluation, and group learning being learning enhancing (hence the emphasis on observational evaluation and group learning being mainly mixed ability); and about protecting and enhancing the crucial bond and trust between classroom teacher and child. The NAPLAN-based curriculum in being about the measurable, does not fit with the affective; the holistic curriculum in being expansive fits with it perfectly. The NAPLAN-controlled curriculum is instrumental; the holistic curriculum is democratic and participatory. The NAPLAN-controlled curriculum implies certainty and someone who knows; the holistic curriculum implies openness and collective exploration about what is known. The test-based curriculum because it implies certainty and someone who knows leads to a hermetic system based on fear and dependence; the holistic curriculum because it implies openness leads to continuous exploration based on trust and independence. The NAPLAN curriculum is hierarchical and standardising; the holistic curriculum is democratic and characterised by variety. Because NAPLAN is about hierarchy, certainty, and standardising – it means no variance and it means compulsion. Because the holistic is about valuing variety, about democratic, participatory relationships – the holistic means the freedom to be holistic not the requirement to be so. The managerialist restructuring of primary education based on a test-oriented curriculum is about hierarchy of the sort that functions on the belief it knows; it knows how education works, how it can be organised and standardised into unproblematic and manageable parts, made utterly assured in its mission by the ideas of quantitative academics who also know. A holistic restructuring of education based on teacher knowledge, relies on common-sense through informed experience, on the value of variety in education, on education as part of life in a social democracy, on identifying the essences of curriculum areas (guided by the competencies), on a commitment to abroad-based curriculum, and on teaching and leadership being significantly an art. Dominating the current education system is the neo-liberal concept of the need to avoid provider capture. This concept, developed from the ideas of Ayn Rand, interprets human behaviour as based on the pursuit of self-advantage and society being the better for it. The effect has been to hand school education over to those with little or no experience in school education and to make the education system authoritarian by design – power forever shifting upwards. Education is certainly not the better for it. These new people are doing terrible things to primary school education, their consciences protected by their ignorance and that ignorance by their arrogance. What use to talk of the holistic to these people, of the subtleties, for instance, of bringing early readers along? They no doubt think we are talking gibberish. Their confidence in their understanding of education – always narrow, fragmented, and constructed for measurement – bolstered by quantitative academics flown in for the purpose. The effect has been the process described by Orwell: the past bad-mouthed, neglected, pushed aside, verboten, and forgotten – to the devastation of the present; and hopelessness of the future. In what other major agency of state, as a matter of policy, would there be a concerted effort to appoint people to high position with little or no knowledge or experience of that agency’s central function. The following long paragraph is an example of the toxic combination of lies, false statistics, and secret agenda referred to. The length of the paragraph is figurative for the growing stain of evil and corruption spreading throughout primary education. There is the intense political pressure for results encouraging secondary schools to advise children to move into less challenging units; also to use internal exams in a way that virtually excludes failure. And one of the reasons many children can’t do challenging units is because for the last two decades flexible thinking has virtually been excluded from the primary curriculum. There is the intense pressure on primary schools via league tables for ever-improving results which encourages a very liberal interpretation of children’s test performances; there being no moderation policies in place. In other words, the system is set up for corrupted results.This leads on to charter schools producing corrupted results by the same process but even worse because there is no supervision at all by official agencies, just a group appointed by ministry with, of course, no interest in probing rigorously. This corruption of results has a sinister purpose because charter schools are being set up as a platform to denigrate public schools with a view to eventual privatisation of public education expected . As for primary charter schools, they are being set up as lavishly funded private public schools, an oasis of privilege, in a desert of poverty. These charter schools will be able to attract certain children, while being able to exclude others. Some public schools have a 100% turnover of children every three years or even less. Such children will not be accepted into charter schools even in the unlikely circumstance of them applying. The charter schools will have much lower teacher to children ratios and more funding for computers and other resources placing the local public schools at a further disadvantage. The huge unfairness of attracting likely better children to charter schools will have the effect of ghettoising the public schools leaving them shorn of the better performing ones. The role of the government is not to privilege some publically funded schools to the disadvantage of others. This is unfair and morally bankrupt. But calumny on calumny, the corrupted results from the charter schools will then be used to cast a slur on all public schools, to demoralising effect. The present system is held together by fear and a world view of education based on lies and false statistics. THEN Make sure you read ‘Dangerous Ideas’ by Derek Hedgcock in THE TREEHORN EXPRESS next week-end. An article from USA, but then again, since we unquestionably follow USA education policy, its relevant all over. Another blog by Peter Greene, sounding off at the ineffective teacher refrain that is being used to attack the profession around the world and particularly in the so-called Anglo-Saxon countries of England, Australia, Canada, New Zealand and USA. Is this a coincidence? What do you think? Excellent article by reading expert Ken Goodman, contrasting the way children actually learn to read, with the commonly held notion of the technocrats. “Yes, teaching can be that stressful. Children’s lives are at stake. “After all, some things stick with us, becoming our sacred tenets about teaching and learning, shaping our personal and professional lives in profound ways. The Right to Learn – an agenda for the 21stC; challenging the status quo. Another from Bruce’s oldies but goodies file, looking at the role of technology in education. Why can’t schools focus on the whole child again? The attachments contain an eight-page presentation and a one-page summary. Since managerialism infected the operations of businesses and government institutions in the western world in the 1980-90s, and neoliberal [conservatism on steroids; control of government institutions by big business] policies were adopted by the major political parties*, the effects on school children and their life chances have been marked by dramatic ….. monstrously expensive in financial, social and moral terms….. alterations to education systems whose operations in the main now have a profiteering motive. Neoliberal politicalisation of schooling with profits in mind requires the exercise of at least mild force to succeed. Love of children and the exercise of professional ethics have nothing to do with it. Totalitarian techniques are necessary. That’s the way that neoliberal management has to work, with coercion its motif. Seldom considered are the effects that such attitudes have on the teaching profession’s reactions nor on the emotions and attitudes of pupils. If governments ignore the emotions of school children and prey upon the good nature of teachers, the future for children and the future of their nation is bleak. Classroom teachers, in charge of the nation’s engine rooms, are human beings and they have feelings. The attached paper suggests that responses to fear-laden coercion are more likely to be feelings of ennui, marked by discontent and dissatisfaction, than by any kind of enthusiasm for the collection of data from hassled kids. Now to the inserts …. click either. New Zealand readers, substitute ‘national standards’ for ‘common core’ but otherwise this article is relevant all over. I’m a teacher. I never saw this coming. A story from Canada that will resonate with teachers all over. A must read article about Pearson Group, possibly the biggest threat to education around the world. “Pearson Personalized Learning” is not about supporting schools; it is about replacing them. And it is about replacing them without any evidence that their products work or any concern for the impact of their products on schools and student learning. Yet another academic shooting holes in PISA – reformers, please take note! A variation of this is found all over – teachers spending their own money on classroom materials. This is totally ignored by teacher bashers, probably because they have no idea this happens. Surprise, surprise, not that our corporate influenced politicians will take any notice. Poor Australia, what did they do to deserve this? “Project-based learning is based on the idea that students learn best by tackling and solving real world problems. Students are much more engaged with the subject matter and look to the teacher as more of a coach who guides them through their own reflections and ideas. Project-based learning often involves students working in pairs or groups, thus facilitating a deeper understanding of cooperation and communication in solving problems. A warning for New Zealand schools and, most likely, for Australian schools. There are now NO public schools in New Orleans – a text book case of disaster capitalism. An excellent article that is applicable all over. PLEASE: Send this to more and more schools AND to your local politicians, won’t you? For the kids’ sake. Pretend that you are an Education Minister or shadow minister in one of Australian States or at the federal level; and that your colleague, Mr. Chris Hipkins, the child-oriented shadow minister for education in New Zealand, has ‘possessed’ your intellect. You respond as truthfully as he usually does to the sort of questions that Aussie ministers are likely to receive. 1. WHY DO YOU LIKE NAPLAN ? I don’t. I hate it. It bleeds the very soul out of children’s learning. It’s unfair to kids. It halts the development of their intellect and damages their mental health. What is there to like about it? We can’t pretend it’s useful in any way, can we? 2. DO YOU KNOW THAT WELL OVER 80% OF YOUR TEACHERS ALSO HATE IT? Yes. I do. 3. THEN WHY DO YOU PERSIST WITH IT? I’ve got no choice. Julia heard about it at a cocktail party in New York, then bank-rolled a visit of its inventor, arranged and paid for by the bankers and the top-end-of-town plutocrats; then she put it into action using a very expensive, large network of offices, eichmannised data collectors and officers…. It’s so enormous and costly, that it would be too embarrassing to unwind it. We daren’t reveal the cost. I’m told by my henchies that its cost is out of all proportion ….just to check out a few aspects of literacy and numeracy. Embarrassing, really. I’m stuck. 4. WOULDN’T YOUR CONSTITUENTS APPROVE OF SHIFTING THE MONEY TO SOME OTHER PART OF SCHOOL EXPENDITURE? Maybe. But then, we don’t tell them much about its effects on the kids in the classroom. We try not to talk abut it much; and you will notice that the media respects this idea. We try not to worry about it much; and, so, nobody else does Most parents think that NAPLAN testing is mandatory and that it is a ‘good thing’. They don’t care much about kids while they are at school, anyhow. We trade on that. 5. WHAT ABOUT THE DAMAGE TO THE KIDS? Nobody seems to care. Despite the research evidence about distress, vomiting, crying, sleeplessness, intellectual damage and the halt to cognitive development, not many adults care. Really. Think about it. 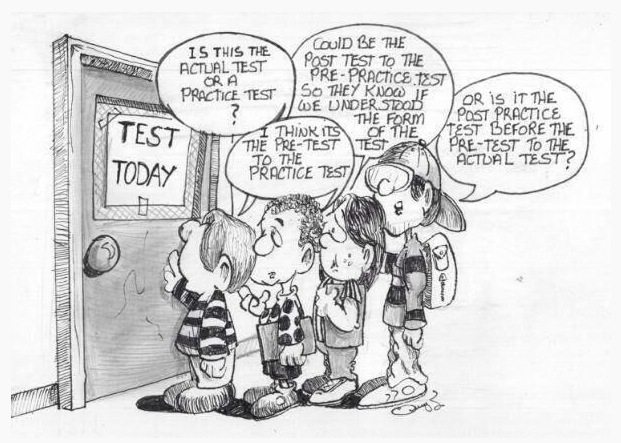 We’d all prefer to pretend that frantic test preparation is much like the exam ‘swot’ in our day….toughens them up. Only happens for a few months each year. 6. YOU’RE KIDDING ?! Maybe. But….can you see what Rupert’s media outlets would do to us if we banned NAPLAN! Heck! Name one Australian politician with the moral integrity to stand up to him. Just one. Buggered if I am. The party room, where these sorts of things are decided, would tear me to pieces. 7. WHY DO YOU THINK SOME SCHOOLS AND PRINCIPALS APPROVE OF IT? If your school is in a ‘better-class’ suburb, the results enhance the school’s reputation. Some go along with those ‘upwardly mobiles’ who believe that a good score will give their child a better chance to enrol at a ‘better’ school. There are also some principals who would also receive HDs in ‘Skilled sycophancy’; distinguished by their brown noses. 8. WHAT DO YOU THINK IS A ‘BETTER’ SCHOOL? Without question, the neighbourhood state school that teaches an holistic curriculum and cares about the local community’s kids. Most state neighbourhood schools do better on the stupid tests, anyhow. 9. DO YOU MEAN A ‘CHARTER’ SCHOOL ? Doesn’t matter. Charter schools. Gates Schools. Pearson Schools. We call them Independent Public Schools. Don’t laugh. It was a really stupid idea. We’ll bring them back to the real world as soon as we can. They’re a real ‘no-no’. 10. SOME PRINCIPALS AND TEACHERS RECKON THAT NAPLAN HAS DIAGNOSTIC PROPERTIES. Yes. They do. Pull this one. Test in May and diagnose in September! Come off it. Serious evaluation is part of the process of teaching. It’s part of the process of developmental learning in all aspects of Learnacy itself. NAPLAN is only for gathering data….totally useless data, that’s for sure….but we are stuck with it for non-educative reasons. That’s all you need to know. 11. HOW DO YOU THINK WE CAN GET NAPLAN BANNED? Get on the side of kids and their classroom teachers. Talk about the effects of blanket testing on kids…loudly. Adults have to become extremely biased against any sort of injury or threat to child welfare during the learning process. BECOME EXTREMELY BIASED FOR THE SAKE OF KIDS. We need to ask teachers and principals, as much as we love them, how dare they treat our children the way that they do. We need to react quickly and loudly to the slightest assault on our kids’ welfare. We need to think very, very seriously of the consequences of high stakes testing on our wonderful kids’ cognition and emotions. The tension and stress affects them; damages kids for a lifetime. KIDS. KIDS. KIDS. Focus. Let’s play fair. 12. YOU”LL MAKE A GREAT MINISTER ONE DAY, WON’T YOU? Yes. FELLOW EDUCATORS : Please send this along to people in schools as extensively as you can. Those who already do…..thanks from Treehorn and the other kids. USA has a penchant for branding and packaging things as neatly as possible. As far as schooling is concerned, a canny money-hungry educator can extract bits from the regular school curriculum, invent a catchy vogue-word to describe what-ever-it-is that needs attention, then wrap the contents up and peddle it to the gullible. Bingo! Legs 11 ! Holidays at Waikiki. If it cannot be wrapped up, it is branded and sold in bulk…. as ‘Models’….. by sweet-talking peddlers at conferences and seminars;…. and cocktail parties.. This comes as little surprise when it is a fact of life that schooling in America is owned and dominated by well-heeled corporate plutocrats., whose political influence in the other three English-speaking GERM countries is becoming as extensive as it is in the old US of A. The teacher-proofing edubusiness is big time and is exercised in many forms. Its enormity and influence is far, far more extensive than the ordinary Michael Dundee Aussie would believe. Sage educators in the UK and in NZ don’t usually do this. Despite the heavy hand of neoconservatism that all countries share, they have always tended to treat teaching as a noble profession that actually pupils [aka teaches]children according to each child’s frame of reference. The child is the package. The teacher’s role in the act of teaching and evaluating and moving ahead is total. Unsubstantiated, untested, unprofessional, gimmicky quackery stops at the classroom door of their lively learning centres, where the child is treated as the centre of the universe and its performance is judged by its interest in learning. Diagnosis and evaluation is part of each activity. A school’s reputation is based on the way it treats children. If parents want to know about the best school around, they go to a reliable source…..the shopping centre…get the real deal……certainly not to unreliable, crooked test results, used by the unwitty for comparative purposes..
Of the four English-speaking, politically-controlled education systems – the GERM countries – Australia religiously follows what the USA does; no matter what… blindly as a rule. It’s all high stakes data-laden emotion-free performance-testing stuff which Americans love. Aussie unemotional, couldn’t-care-less, morally corrupt testucators now use it without second thought. Bugger the feelings of kids. Obediently, we followed the ‘Kleinist Model’ holus-bolus, called it NAPLAN, and continue to maintain its demonic philosophies with the sternest controls possible…. Iraq-like. How many of us teachers have tried and become enthused – for a while – by some such package, only to find that the package takes over the teaching? Precious school time is devoted to completion times and corrections while our own professional judgement and modes of evaluating take a back seat? In ancient times, I was an SRA structured reading and IMP specialist. Mea culpa. I hope such indiscretions are forgivable. How often have we been seduced by brand names for special movements and innovations; and have crossed swords with colleagues until things settled down and the next craze came along? We have discoursed about…. open and traditional…. phonics and whole-word….new maths and maths…persuasive and traditional…..child-centred and subject centred….composite and multi-aged….charter and mainstream…..education and testucation….child-based and didactic….? There is a new list on the way from up-above…..data-driven instruction, blended learning, differential learning, closing the achievement and talent gap, student-centric instruction, yap, yap. Makes one ever wonder what ever happened to classroom teaching as a descriptor? In America it is said: “Schools nationwide continue to adopt student-centric instructional models that use data to empower teachers and engage learners. Data-driven instruction has moved beyond the education-buzzword sphere to educators’ daily lexicon.” So, Kleinism aka Naplanism is now permanently embedded in many of that nation’s schools…..more so in ours. The article continues : “In this ASCD Smartbrief Special Report, we provide a round-up of news about recent trends in data-driven instruction, blended learning and stories about how some schools are preparing the next generation of data scientists.” Getting everybody ready to be rocket scientists! Thinkers and learners? The sorts of initiatives that we have imported [e.g. charter schools] and embedded in the data-laden environment of NAPLAN and its hellfire cobbers are a serious threat to our future. Such restrictions to serious school learning will continue (“The whippings will continue until morale increases” policy. ) in Australia while we continue to adopt the American mind-set. Schools in Australia are not run by teachers any more, but by remote control. Political control of national testing programs is the most successful method of isolating teachers from effective teaching known to mankind; and that kind of conditioning suits the package-deal spirit of teacher-proofing. Coercion always induces low level acceptance of a profession as a profession, so the outcome is that better teachers are quitting; neophytes with potential don’t last long; and better-quality applicants don’t want to join the profession because of our leaders’ grossly unprofessional attitude to children and their teachers. Make no mistake. This is a critical issue. If you wish to receive The Treehorn Express direct, please contact me. Today I will prepare you for the future. Until I started being here with you. This response to legitimate authority is learned in a variety of situations….. in the family, school and workplace. Milgram undertook the experiments because he had wondered if ordinary American folk would be capable of undertaking the kind of activities that ordinary German folk had performed during the Nazi regime under the authority of Adolf Eichmann, who claimed that he, in turn, just ‘did as he was bid’; and whose conscience didn’t bother him. Of course, Australians would never [ like those Americans and Germans] do anything against their ethical principles no matter who bossed them around! Never! Huh? It is clear that there has been an enormous change in the political climate in western countries since the days we all believed in and adhered tenaciously to the Rights of the Child. Remember 1979, The Year of the Child when the catchy tune ‘Care for Kids‘ led the charts? Despite our many failings, we once protected kids from dangerous extraneous influences. Personal codes of conduct were not a sham that merely represented authority’s code of control. Now. During this present extraordinary period of our history, controlled as it is by corporate neoliberalism – conservatism on steroids –, eichmannism has seeped into and become a feature of the teaching trade. Having allowed managerialism to infect its institutions, the former great profession no longer represents its clients adequately nor protects them from the sneaky, shady influences of politicisation and corporate greed. The Stockholm syndrome kicks in and plays its insidious role. Evidence of this kind of coercive control and its outcomes are manifest. In Australia, teachers are not allowed to describe their own feelings to the public about NAPLAN tests. Principals cannot mention publically that parents have the right to say, “NO”. Some teachers who help children to feel more at ease during testing time, are punished. Others go to extraordinary lengths to settle the victims down. [sleep-overs, breakfasts, rewards]. Mystical privacy laws are invoked by the meek when questioned privately. A tenuous Code of Conduct is used by authorities and school leaders as an institutional whip. Nothing is done about the assault on children’s emotions….only talked about. Anti-naplanners [them ‘kid-lovers’] are seen as seditious. Verbotten! Dissembling professional clashes between educators and testucators have become part of the scenery. Never before. Political gimmicks [charter schools, year level distribution, curriculum ‘improvement’, ‘Accords’ amongst them] are allowed to permeate the teaching culture as solutions to a mythical standards crisis. This is 2014-style schooling. Embedded Eichmannism has become a very serious threat to our children’s emotional welfare and our general future. Our better nature reacts against fear-centric teaching techniques; but we sheepishly do as we are told. What should we do? Just keep going?